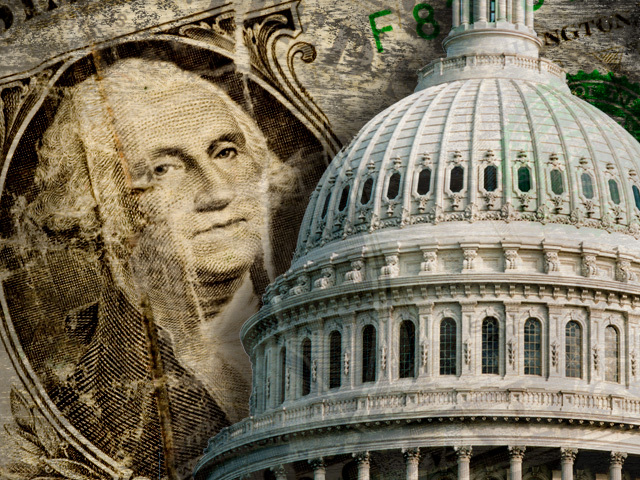 If the Republican majority in Congress really wants to cut back on government waste, it can find some inspiration from a pair of reports recently released, detailing examples of egregious spending and programs that could arguably go on the chopping block. Rep. Steve Russell, R-Oklahoma, last week released the first edition of his "Waste Watch" report, which identifies 10 specific instances of recent government waste, totaling more than $117 million. Russell is picking up the torch formerly carried by Sen. Tom Coburn of Oklahoma, whose "Waste Book" annually laid out examples of government excess. Russell writes in the introduction of his report, "For the most part, this money has already been wasted. However, each item points to larger, ongoing issues that merit further oversight, investigation, or action by Congress in order to protect taxpayer money." Most of the examples from Russell, an Army veteran, pertain to defense and foreign policy. For example, in 2012, the U.S. paid an Afghan construction firm nearly $500,000 to build a training exercise facility for the Afghan Special Police. However, just four months after the project was finished, the facility's walls began to disintegrate in the rain. It turns out the contractor constructed the facility out of bricks made of sand, ignoring construction quality standards required by its contract. The U.S. has yet to recoup its money; meanwhile, the contractor is still technically eligible for other U.S. contracts. As tax day looms, GOP pushes "taxpayer bill of rights"
Russell's report also notes how the Defense Department spent about $15.4 million in 2013 to keep items in storage even though no one in the military had requested those items for at least five years. The equipment in storage included items like circuit boards and tire tubes, according to Russell's report. The report also cites a case of imprudent money management by the Missile Defense Agency, which ended up paying about $11 million more than necessary for an interceptor system. If the agency had waited five days to review an audit of the contract, it would have realized the contract was over-valued. Meanwhile, the group Citizens Against Government Waste has produced its own report, called "Prime Cuts," of ways the government could save money. This year's report contains 601 recommendations that could theoretically save taxpayers $639 billion in one year and $2.6 trillion over five years. The recommendations include right-wing policy ideas, like raising the eligibility age for Medicare and eliminating the National Endowment for the Arts. Other recommendations, however, are less partisan. For example, it notes the Defense Department could save money by eliminating congressional add-ons for the M1 Abrams tank retrofit program. The report points out that in 2011, the Pentagon proposed suspending production of the tanks until 2017 because it had enough already. That would have saved $3 billion. "However, due to the tank's many suppliers spread across numerous congressional districts, legislators have continually added earmarks for the program, including one worth $120 million in FY 2015," the report says. The report also contends that by eliminating the Market Access Program (MAP), which helps market U.S. agricultural products overseas, taxpayers would save $1 billion over five years. Beneficiaries of the program have included companies like Sunkist, Tyson, and Welch Foods. President Obama has in the past also called for reducing how much the government spends on the program. Of course, most recommendations for trimming federal waste amount to a drop in the bucket: The U.S. is expected to spend about $3.9 trillion this year while the federal debt stands at about $18 trillion.